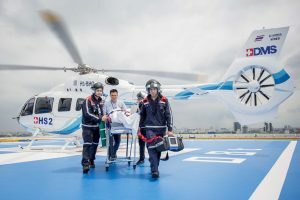 Bangkok, Thailand, July 12, 2017 /ChinaNewswire.com/ - Thailand's first full-scale emergency center operated by a group of private hospitals, Bangkok Dusit Medical Services Public Co. Ltd. (BDMS), provides 360-degree of international standard healthcare services, which include medical evacuations; conditions assessment and treatment plan; hospitalization and treatment; coordination with assistance and international insurance providers; and worldwide repatriation. Foreign visitors in Thailand can simply dial 1724 for Thailand domestic calls and no. +66-2-226-4565 or +662 BANGKOK for international calls from neighboring countries, to access BDMS' emergency medical assistance. The one-stop service center provides 24-hour English-speaking staff and on-call interpreters. With the network of 45 hospitals, of which BDMS Trauma Care Center at nine major hospitals carry Center of Excellence status, the network covers every corner of Thailand – including popular tourist destinations Chiang Mai, Pattaya, Phuket and Samui – and in Cambodia, Laos, Myanmar, Vietnam, and China. The center offers 65 board-certified medical specialties for emergency situations, available for consultation 24/7, include Trauma surgery, Neurosurgery, Orthopedic surgery, Cardiothoracic surgery, Pediatric surgery, Travel medicine, Aviation medicine, Stroke, and many more. The ethics-driven medical expertise and highly experienced Emergency/CCU teams are able to cope with complex disaster management on a mass scale, as well as timely and personalized response. Medical protocols include patient assessment, preparation, transportation, and treatment, are aided by close-at-hand communication channels on the ground in the provinces. Emergency evacuation will be dispatched as appropriate using BDMS' dedicated CAMTS*accredited ambulance fleet consisting of air, land or sea medical ambulances. Timely and effective patient case management is ensured via integrated digital and GPS network. BANGKOK DUSIT MEDICAL SERVICES Public Co., Ltd. (BDMS) is one of the most comprehensive hospital networks in Asia-Pacific. Boasting 14 JCI and 11 CCPC accreditations, BDMS delivers world-class care to an international clientele, providing top-tier services and facilities and skilled specialists in various fields. The unique BDMS network of 45 hospitals stretches across all of Thailand’s regions. The group currently owns and manages six major hospital brands: Bangkok Hospital, Samitivej Hospital, BNH Hospital, Phyathai Hospital, Paolo Hospital and the Royal Hospital. Our hospitals are located throughout Thailand, in all major cities, including Bangkok, Pattaya, Phuket, Chiang Mai, and Samui, as well as two hospitals in Cambodia. In order to serve emergency patients across Thailand plus the neighboring countries better, BDMS upgraded nine hospitals into Centers of Excellence (CoE) focusing on 5 key clinical areas, Trauma, Orthopedics, Cancer, Cardiology, and Neurology. Altogether they offer 65 board-certified medical specialists who are available for emergency consultation 24/7. The CoE status exemplifies the highest standards of medical care not only based on their state-of-the-art facilities and scope of medical specialties, but also on their academic excellence covering clinical studies, training, innovation and international affiliations. BDMS’s nine CoE and their city location are: Bangkok Hospital, Bangkok; Samitivej Sukhumvit Hospital, Bangkok; Samitivej Srinakarin Hospital, Bangkok; Phyathai 2 Hospital, Bangkok; Bangkok Hospital Phuket; Bangkok Hospital Pattaya; Bangkok Hospital Udon Thani; Bangkok Hospital Chiangmai; and Royal Phnom Penh Hospital, Phnom Penh, Cambodia. Source: Bangkok Dusit Medical Services PCL.